Rovaniemi in Finland is a true winter wonderland. From witness the Northern Lights to Lapland safari tours, there are so many things to do in Rovaniemi that you will need at least 4 days to explore the Finnish Lapland. It was our first time in Finland, and I’m so happy that we traveled to Rovaniemi in winter time, we got the chance to see the best of Lapland and have fun in the middle of the snow. 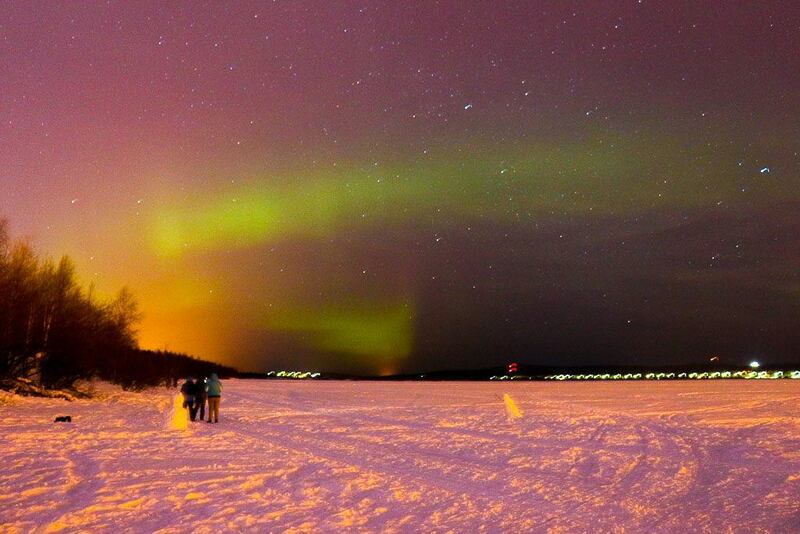 Every year thousands of people travel to Rovaniemi to see the northern lights. The Aurora Borealis is just one of the top things to do in Rovaniemi, there are plenty of activities for couples, group of friends and families. It was my first time in such cold destination, we got – 10ºC to -18ºC and I thought I was going to freeze. Rovaniemi is the perfect destination for travelers who want to combine adventure, culture and northern lights is only one trip. Most of the activities are outdoors, so be prepared with warm clothes and woolen socks. Be ready for only a few hours of the daylight and strong winds at night time. 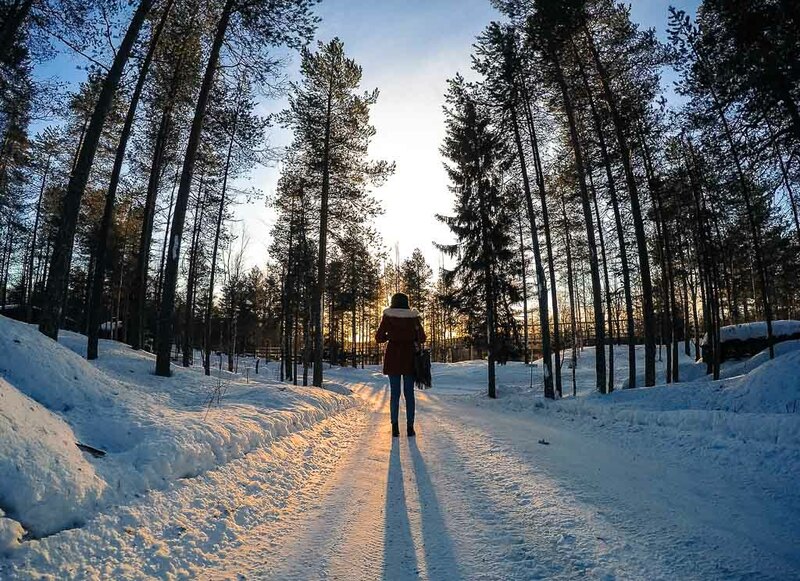 Depending on your level of adventure and how much you like to be outdoors, the list of things to do in Rovaniemi can become bigger and bigger. Our suggestions of what to do in Rovaniemi is a mix of activities and experiences, things that you must do when visiting the Finnish Lapland. Seeing the northern lights was a dream come true. The green lights started suddenly and in waves they took the sky. It was a mysterious and majestic spectacle, an experience of a lifetime. We knew it wasn’t easy to see the aurora borealis, that’s why we planned 4 nights in Rovaniemi, so we would have more chances to see it. There are two ways that you can hunt the northern lights in Rovaniemi, one is going on a tour and the other is doing it by yourself. Both of them can be fun, beautiful or disappoint, depending on the weather. There are many types of tours, from groups to private, snowmobile adventure, chasing the northern lights on a dog sled and many more options. You can choose the one that suits you better. We choose the tour that goes to a place outside of town where we have an open fire with food, drinks and we wait for the Northern Lights to show up. 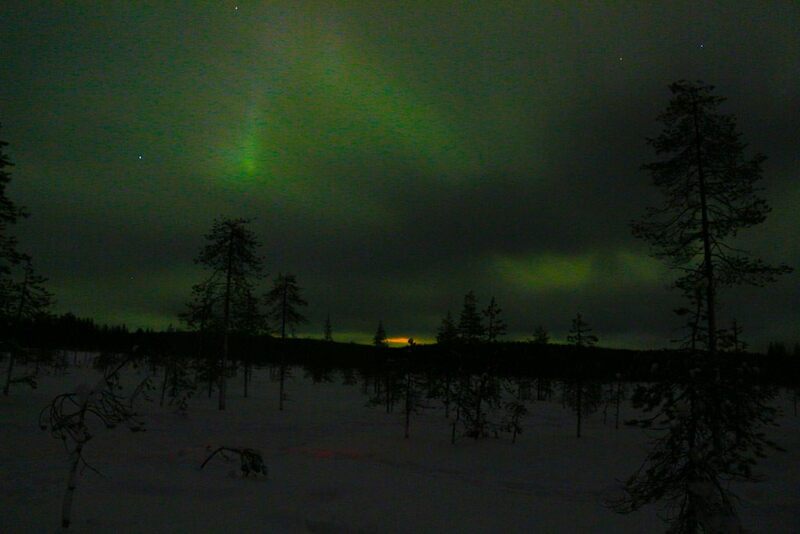 We did the tour with Safartica and paid 69 Euros per person for 3 hours of Northern Light Tour. The bus departed from the city center and in a few minutes, we were outside of town. The guides were great, funny and we had a lovely barbecue with sausages and sandwiches. The weather forecast was promising with lots of solar activities but the sky was covered with heavy clouds. The hours were passing by, we ate, we laugh and we stared at the sky like kids. One of our guides told there was a small chance of a strong wind to blow during the last half an hour of our tour. And we kept looking at the sky hoping to see a star as a signal that the clouds would disappear. Ten minutes before our tour finished, one of the Chinese girls started screaming that she saw a star. One, two, three… Like magic the clouds were gone, the sky was deep blue and at the horizon, the green flares started dancing in front of us. Until now, when I think about that moment and I don’t have words to describe my feelings. It’s was a unique experience, nature in all its glory putting up a marvelous show. The guides let us stay longer than we should, and we enjoyed every second of it. We were like kids, running on the snow, trying to catch the best shot, point to the sky trying to follow that beautiful dance, with a big smile on our faces and hearts full of happiness. The next night we went to see the northern lights by ourselves. 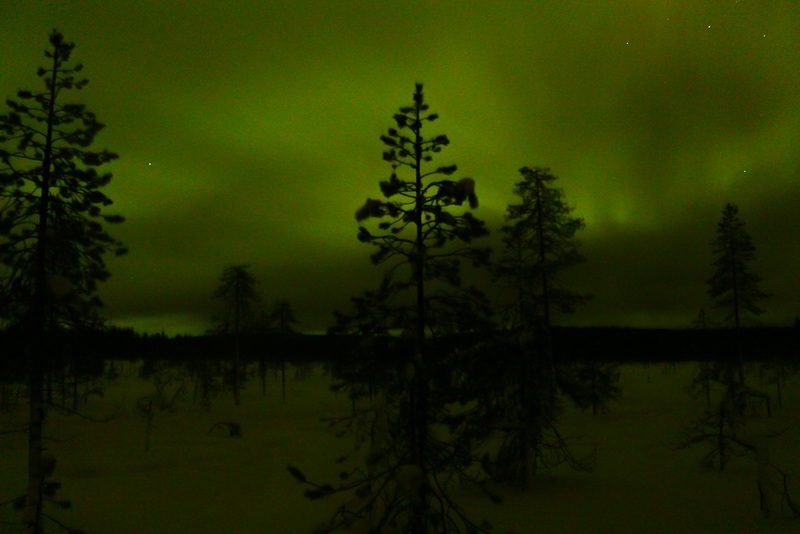 If you are traveling by car or if you rent a car in Rovaniemi, you can go outside of town, in a dark area where you have a better chance to see the Aurora Borealis. We didn’t have a car, so we went to the park that is located in front of the Arktikum Museum, on the frozen Kemijoki River. When you arrive there the lights of the city are behind you, so if you are facing the river, look to your left side and you might spot the Northern Lights there. It’s not so easy to see the Aurora Borealis in the city. But if you follow the Northern Light forecast you can try to be on the river banks at the best time. Be prepared for the cold! Seriously, by the river, it’s freezing cold. When you go on a tour they give you an “overall jumpsuit” that keeps you warm and dry. But if you go hunting the Northern Lights in Rovaniemi by yourself you won’t have this professional support, so be prepared. We managed to stay out at the river only 20 minutes, it was almost midnight and couldn’t handle the strong winds for longer. 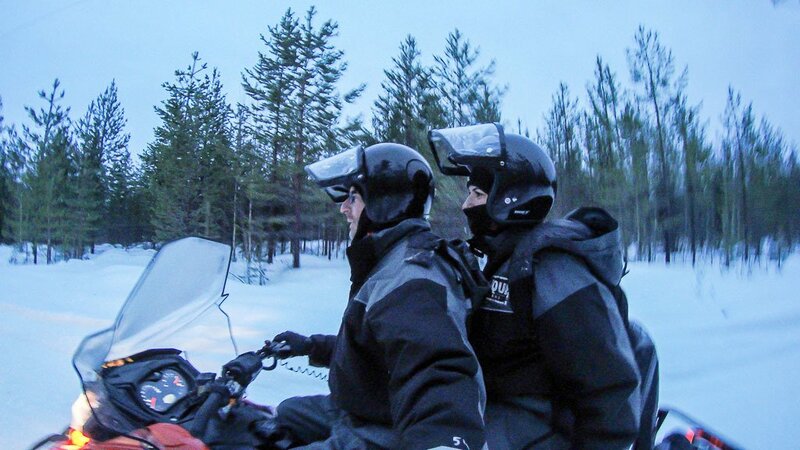 A trip to Rovaniemi must have a snowmobile adventure. Even if you are not a big fan of speed and adrenaline, you need to jump on one of this machines and enjoy the white and beautiful scenery. Most of the activities and things to do in Rovaniemi you need to book at least one day in advance, the same for the snowmobile. You can find many companies offering the snowmobile ride or safari packages, where the snowmobile is one of the activities you will have during the day. Depending on your skills you can go for a basic tour or go for an adrenaline snowmobile tour. You must have a driver’s license and follow all the rules, it’s great fun, but also a dangerous activity. Rob and I got a too excited driving fast on the tracks and we overturned our snowmobile. It was a small accident, but enough to scare the hell of us. Thank God nothing happened to us or to the snowmobile. 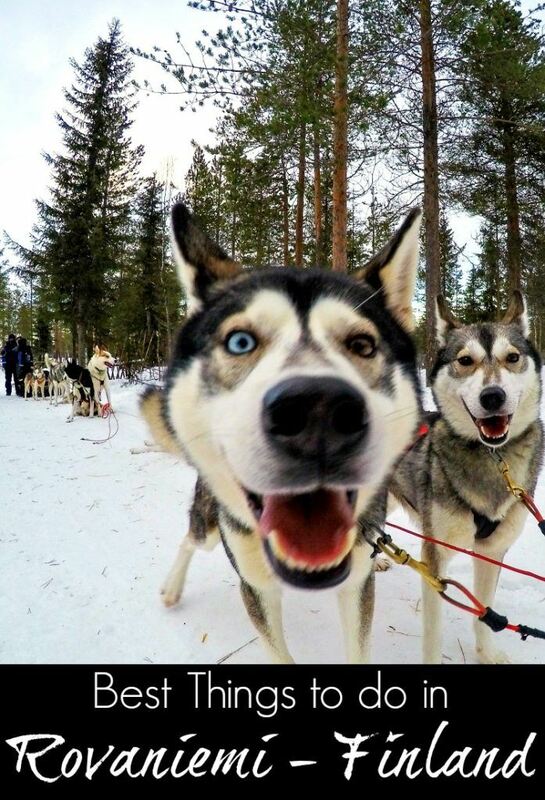 There is nothing more adorable than huskies, even better if you have the chance to see a dozen of them running around the snow. 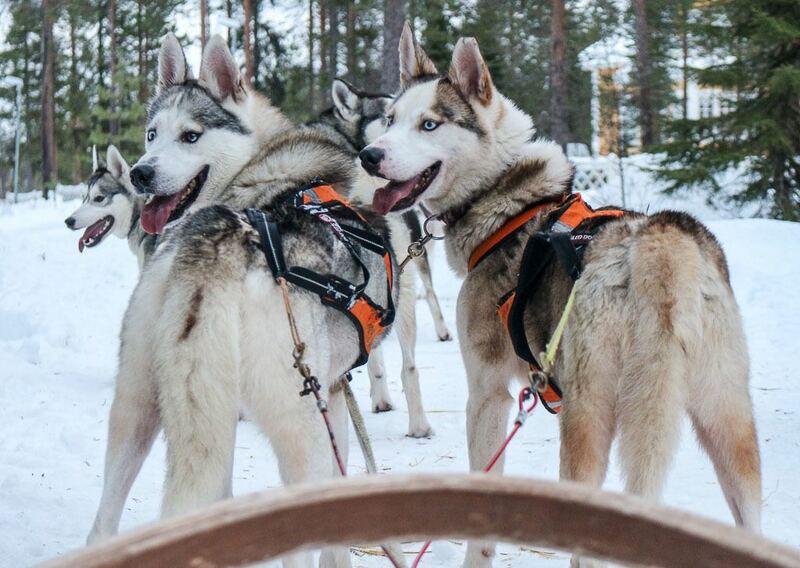 The dog sled is a tradition in Lapland, and you can experience it when visiting Rovaniemi. There are several huskies farms around town, where you can see how they are trained. 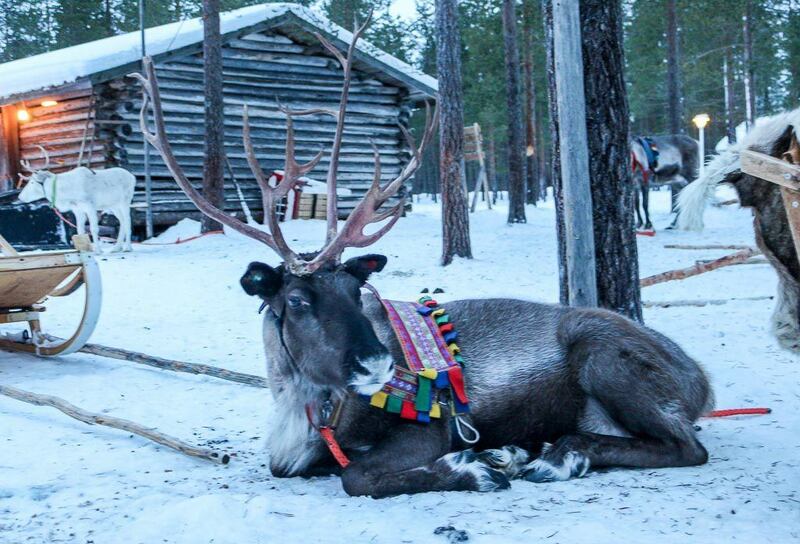 Did you know there are more reindeer living in Lapland than people? That’s true! This and other stories about the Sami people you will learn during a visit to a reindeer farm. 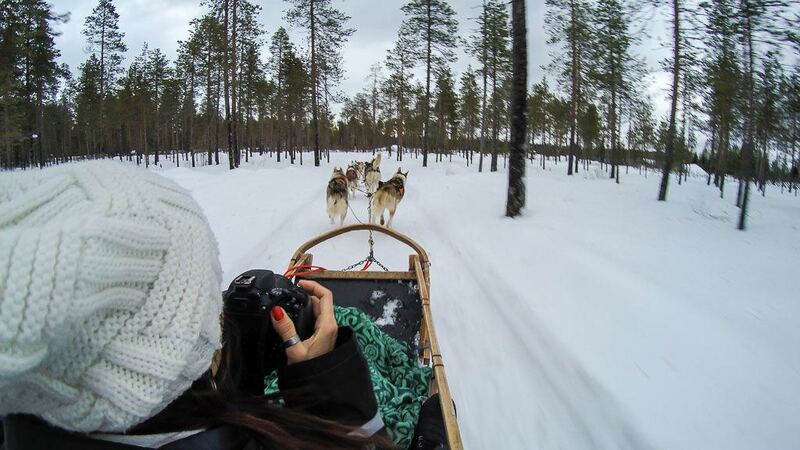 This is one of the top things to do in Rovaniemi, and it’s more fun than it sounds. Go for a Reindeer Safari and discover why the reindeer husbandry is so important for the Lappish people and how the animals are part of the culture. Ride you own reindeer sled and get an official reindeer drive license. But more than that, our tour included a stop for traditional stories, music, berries tea served by a fire and some ginger biscuits. An opportunity to connect with local culture and how people live in such a harsh environment. As I said before, there are many companies offering tours in Rovaniemi. We did a day arctic safari with Wild Nordic Finland combining the snowmobile, husky sled and reindeer farm. We paid 193 Euros per person for the 4 hours tour. I believe it was a good combo, we got a chance to experience a little bit of everything. It was a small group, only 5 people, and a guide. My suggestion is to check all the companies and choose the best option for your schedule, style of adventure and budget. This was the second biggest adventure we did in Lapland. Before traveling to Rovaniemi I didn’t know we could ride a bike over the frozen river or explore tracks in the middle of the snow. 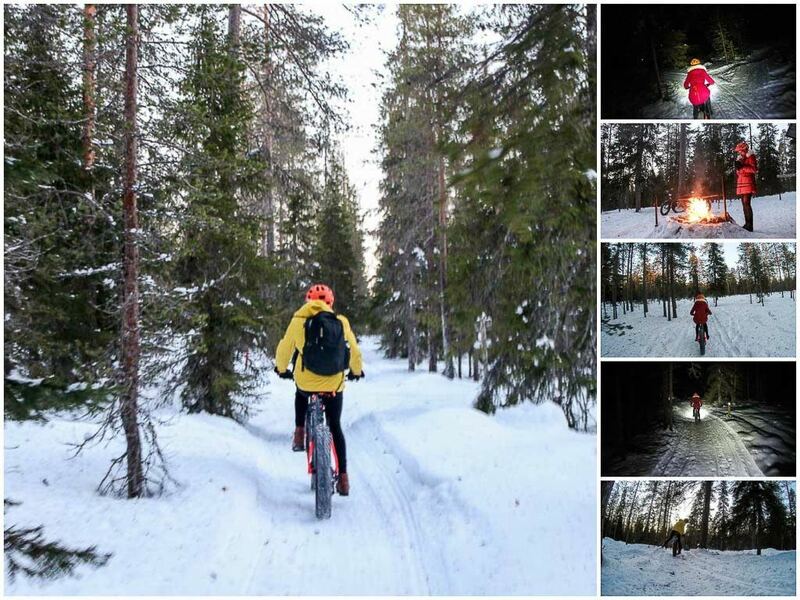 While visiting tourist information center we discovered that the Fat Bike Rides are one of the coolest things to do in Rovaniemi, and we didn’t think twice. We contacted the Roll Outdoors and booked a 3 hours Sunset Fat Bike Ride. It was challenging, cold and so much fun! Seriously, it was a great way to explore the nature, to be in the middle of the woods, breathing fresh air, enjoying the stunning landscape hearing only the noises of the forest and our tires crushing the fresh snow. Our guide, Heikki, was awesome, all the time he was checking if we were ok, if we could go further or if we need to stop for a break. The view from the top of Ounasvaara hill was beautiful, the sunset a well-deserved reward after all the ups and turns. 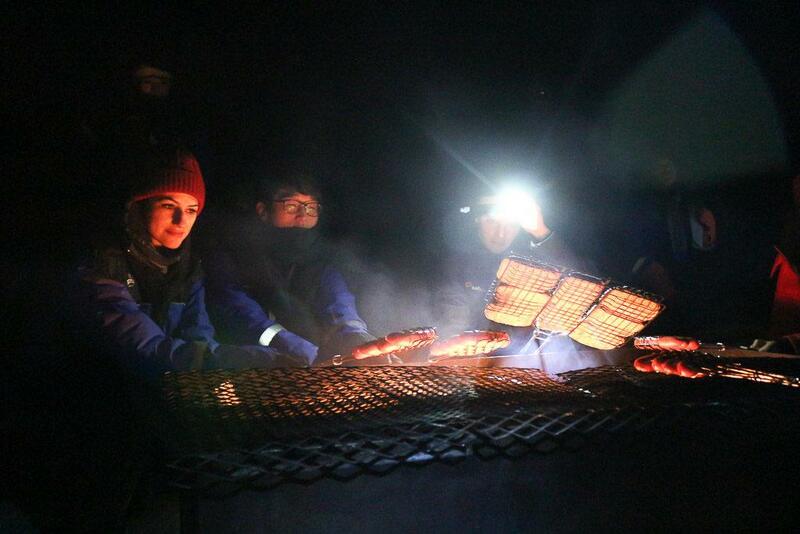 After the sunset, we had a picnic in the middle of the forest, with barbecued sausage, nuts, and warm tea. The perfect stop to recharge the batteries and get ready for the second part of the fat bike tour. The way up was tiring, but the downhill was so much fun and fast. It was dark, but it wasn’t a problem. Our guide was prepared with torchlights for our bikes and like pros, we went all the way down to the frozen river. 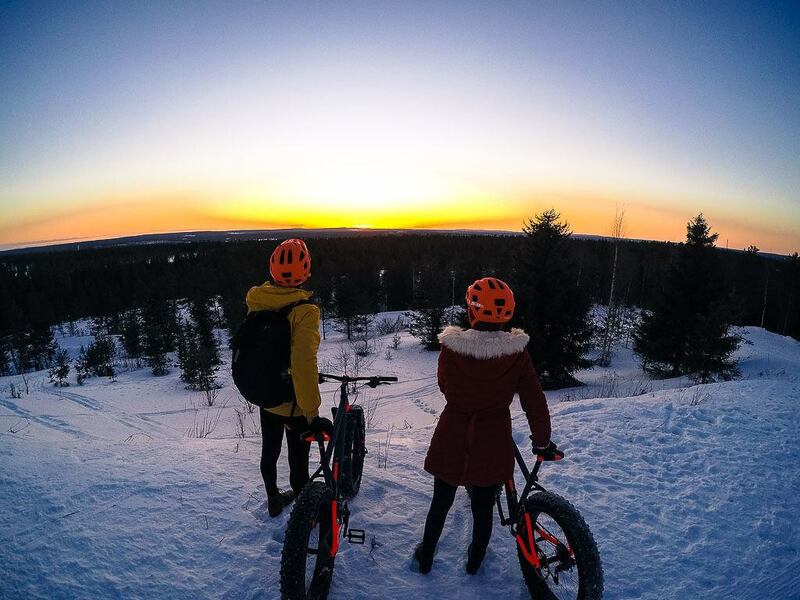 The Fat Bike tour is a real adventure, it pushes you to your limits and gives you an opportunity to experience Rovaniemi and Lapland in an incredible way. My only advice: when booking the tour tell the guide your level of fitness if you are used with bikes and cardio exercises. So your guide can choose the best tracks for you. I’m not a big fan of zoos, but after reading the reviews about Ranua Wildlife Park we decided to give it a try. And it was a great experience, even being a bit far from town it was worth the visit. The park is a 2.8 km trail where you can see over 200 species of arctic animals along the way. It’s not like a traditional zoo with small cages, there the animals are in big spaces, connected with nature. You get the feeling of walking in a natural park. There are several species of owls, foxes, lynx and even polar bear. If you like animals or if you traveling with kids it’s definitely a cool thing to do in Rovaniemi. At first sight, it might look like a place for kids, but believe me, it’s not. 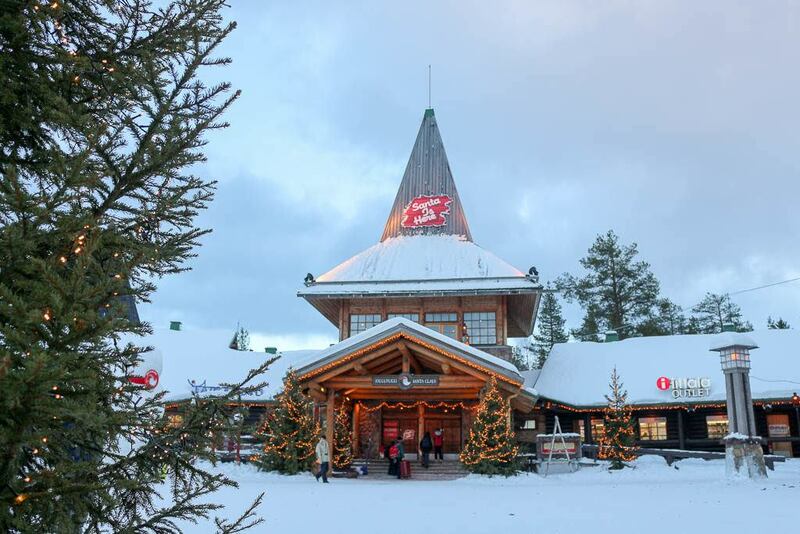 One of the top things to do in Rovaniemi is to visit the Santa Claus house, meet the old man and thank him for all the presents and blessing you receive during Christmas. Don’t get too excited, selfies with Santa are not allowed, but you can pay for a professional photo or even a video of you visiting him. At the Santa Claus Village is located the symbolic line of the Arctic Pole and you can take the “traditional” photo crossing it. A mix of science, history and cultural museum. 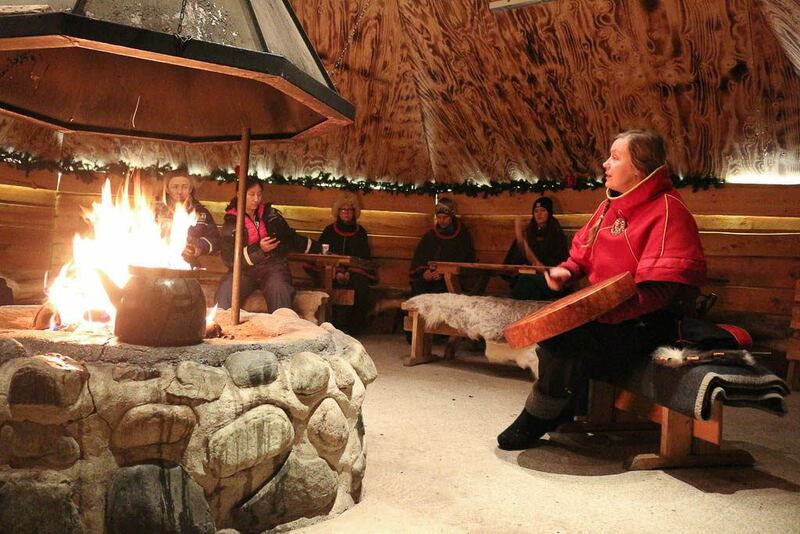 The Arktikum is an interesting place to visit and learn about the Lappish people and their traditions. It has an exhibition talking about the economical exploration of the Arctic Pole and what we need to do to preserve this rich part of the globe. Go there during the evening, it’s less crowded and you get the chance to see the stars through the glass ceiling. There are more tours and activities to do in Rovaniemi, like fishing, cross country ski, swimming in the frozen water, sauna… Some of them require a more time or a more adventurous spirit. My suggestion is, as soon as you arrive in Rovaniemi head to the Tourist Information Center in the main street of the town. There you gonna find all the flyers, contacts and information about things to do in Rovaniemi. Talk to the staff, they are lovely, ready to help you choose and book a tour. Rovaniemi is a tiny city in Finland, almost in the Arctic Circle. A place where traditions and fairytale live side by side. A place where you can sleep in an ice igloo or at Santa Claus Village. The options of accommodation in Rovaniemi are endless, from small guesthouses to snow hotels, and even comfy Airbnb rooms. Here are some options of hotels in Rovaniemi city that are close to the shops, restaurants. Super easy to get around and book your tours. If you like to ski and snowboard, then you can book a room a the Lapland Hotel Sky Ounasvaara that is located just beside Rovaniemi ski slope. For those who want to be in the middle of the wild, an Igloo Hotel or the Arctic Treehouse Hotel are the perfect places. Want something more like a fairytale? Book your room at Santa Claus Village, a great option for families or anyone that loves the Christmas feeling. 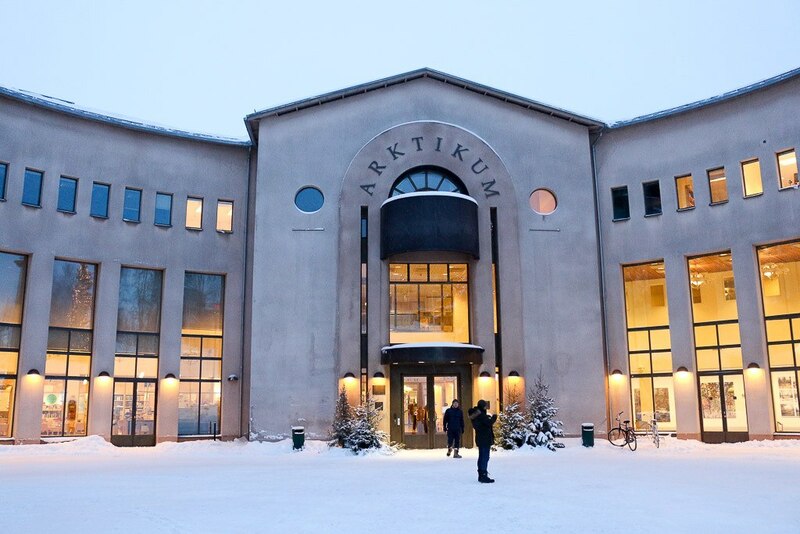 If you are traveling to Rovaniemi on a tight budget, the hotels in the city are the cheapest option and you won’t have to expend any extra money on transportation. Actually, the best value for money would be booking a room via Airbnb. We did that, we booked a room in a lovely apartment and ended up meeting some really nice people. Sign up for Airbnb here and get up to 30 USD credits to spend on your trip to Rovaniemi! Rovaniemi is quite far, traveling there might be easier than you think, but it takes time. The airport receives daily international and local flights. There are direct flights from many European cities, or flights via Helsinki or Stockholm, the two closest big capitals. Rovaniemi airport is Santa Claus Official Airport and during winter it becomes really busy. To search and book the best flights to Rovaniemi use Kiwi.com or Skyscanner, there you can find the best rates and connections. Another possibility to travel to Rovaniemi is by land, using bus or train. If you traveling inside Finland, it’s super easy to book a bus ticket. A trip between Helsinki and Rovaniemi will take approximately 14 hours and you can do it during day or night time. There are two companies offering buses to Rovaniemi: Matkahuolto [this one we used during our trip in Finland] and Onnibus. The train is another good option. The VR, the Finnish train company, operates daily trains between Helsinki and Rovaniemi, and even during the harsh winter the line almost never stops. 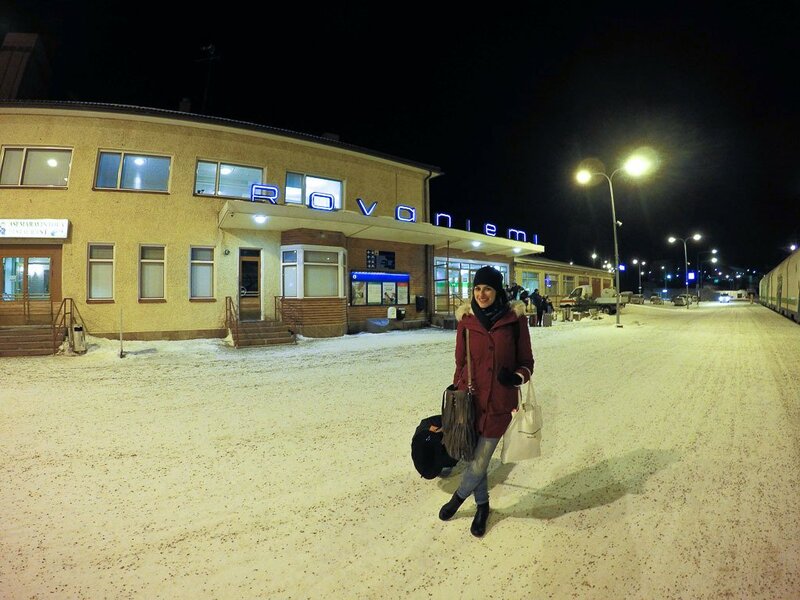 We took the night train from Rovaniemi to Helsinki and it was a great experience. We were traveling with Eurail Pass [1st class], but for this route, we needed to make a reservation. As we decided to travel on a night train we booked a private cabin only for us, and it was a clever decision. The train was brand new, we had our own shower and bathroom. Super comfy and clean. Was worth to pay the extra booking fee, as we saved money on accommodation by sleeping on the train. If you want to know more about Eurail Pass and how to travel by train in Europe, check out our blog post about how Eurail Pass can be a money and a time save option. We traveled the whole Scandinavia and Central Europe with Eurail Pass, a total of 11 countries and only one ticket. If you are traveling from Sweden to Rovaniemi, you can do it by plane, bus, and train. By bus, you can travel all the way from Stockholm [or another Swedish city] to Tornio – Haparanda Bus Station [the border city]. There you change to another bus and keep traveling. You can buy the ticket from point A to B including the connection, super easy. By train is a bit more complicated as there is no passenger train crossing the border. But is totally doable. We took the night train from Stockholm to Luleå, then we changed from the train station to the bus station [they are only a few meters away from each other]. In Luleå we got a bus to Tornio – Haparanda, and from there another bus to Rovaniemi. It was a long journey, we left Stockholm around 5:30 PM and arrived in Rovaniemi around 2 PM on the next day. The good thing is that the bus between Luleå and Tornio – Haparanda was covered by our Eurail Pass, so we didn’t need to book or pay anything extra. We only paid for the last bus from Tornio – Haparanda to Rovaniemi. Now you have all the information and recommendations to plan your trip to Rovaniemi. Things to do, activities and where to stay in Rovaniemi, Finland. Don’t forget to check the weather forecast and be ready for the cold. Enjoy the Finnish Lapland and the amazing northern lights in Rovaniemi. Aurora borealis, from all the things I’ve experienced, nothing beats to see them. Great article, Thank you for sharing. We had a blast in Lapland, so beautiful! As you said, see the Northern Lights is an incredible experience. Unforgettable! I loved the photos! You both looked very cute, including the dogs too! Such a wonderful, albeit frigid, experience. So glad you shared it. We love the pictures of the northern lights. We were so lucky to have the opportunity to see the Northern Lights 2 nights in a row! Looks like such a fun time Natalie. I’d be all over that wildlife park. Cute fox/wolf – which one LOL – and even though it is outside of town a bit I could spend hours in such a place. Beautiful. Animals warm my heart. Which I may need when spending time in such a cold, chill place. Me and my family (husband and three kids) are going from Brazil to Rovaniemi next January! 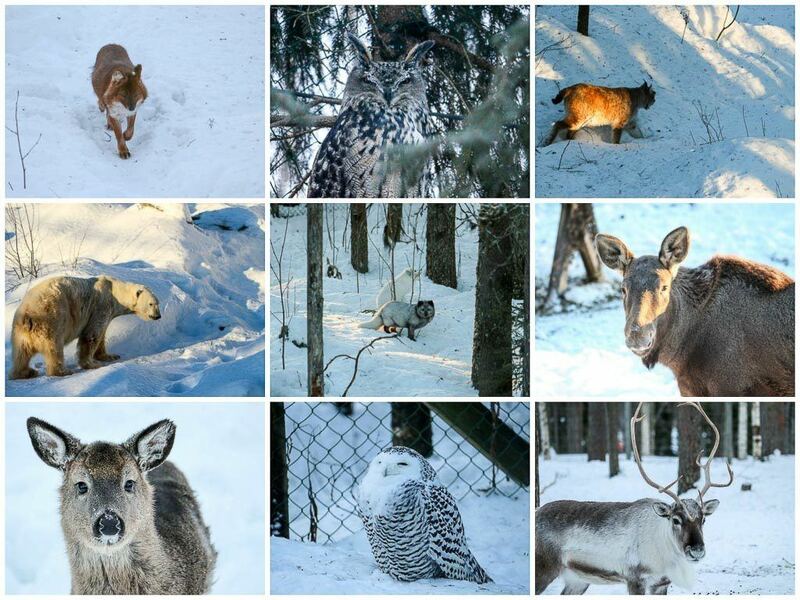 Check the zoo at Ranua, makes a great day trip from Rovaniemi.